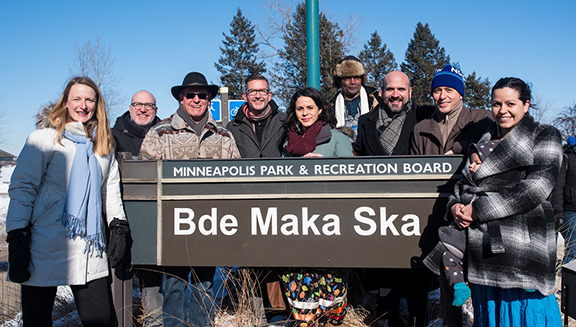 Bde Maka Ska is now the official name of the lake previously known as Lake Calhoun, following county and state approval of a request to change the lake name. Bde Maka Ska (pronounced “b-day ma-KHA skah”) is a Dakota name for the lake that has been passed down in oral history for many years. 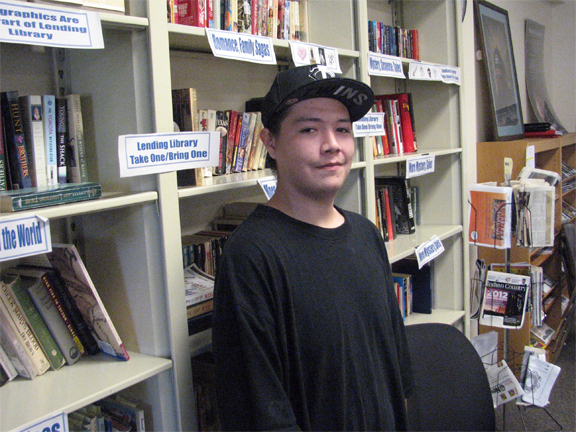 The local American Indian community, and surrounding Dakota communities, still use this name today. Dakota people have always held names and references in the Dakota language for this body of water and surrounding areas. Bde Maka Ska translates to “White Earth Lake” in the Dakota language. Effective immediately, the Minneapolis Park and Recreation Board (MPRB) will refer to the lake as Bde Maka Ska in all digital and print communications and all park entrance signs bearing the name Lake Calhoun are being updated today with new placards that only display the new lake name, Bde Maka Ska. Park entrance signs were previously updated on Oct. 2, 2015 to include both Lake Calhoun and Bde Maka Ska as a public education effort. The MPRB acknowledges that it may take some time to identify all sources where the lake name is referenced and update the name to Bde Maka Ska, but is committed to do so. The names of Calhoun Parkway, East Calhoun Parkway and West Calhoun Parkway will not be changed by this action nor will city street signs bearing those names change, per the recently approved park master plan and the recommendations of the Citizen Advisory Committee. Additional action would be required by the Board of Commissioners to change the parkway names. MPRB Commissioners approved the Calhoun/Bde Maka Ska-Harriet Master Plan on May 3, 2017, following two years of community engagement. An Equity Subcommittee was formed to make recommendations on the plan as part of an ongoing, organization-wide focus on equity. After much discussion, the Equity Subcommittee voted to support the restoration of the name Bde Maka Ska. The final plan, which sets a 25-year vision for Bde Maka Ska, Lake Harriet and the surrounding parkland, included unanimous MPRB commissioner support for the restoration of the name Bde Maka Ska to Lake Calhoun. The MPRB does not have the authority to officially change a lake name. After the Calhoun/Bde Maka Ska-Harriet Master Plan Master Plan was approved, the MPRB submitted a petition requesting the lake name change to the Hennepin County Auditor. A public hearing on the name change was held by Hennepin County on Oct. 17, 2017 and Hennepin County Commissioners approved a resolution requesting the name change on Nov. 28, 2017. Then the County submitted the resolution to the Minnesota Department of Natural Resources (DNR). The DNR announced its approval of the name change on Jan. 18, 2018. The lake name change became official in Minnesota on Jan. 29, 2018, after DNR approval was recorded by Hennepin County and published in the State Register. Next, the DNR will submit the Hennepin County resolution, along with the state approval, to the US Board of Geographic Names, which will approve or deny the name change for federal use. The Calhoun/Bde Maka Ska-Harriet Master Plan includes a public art project along the shores of the lake, in approximate area of the Heyata Otunwe community in 1835. 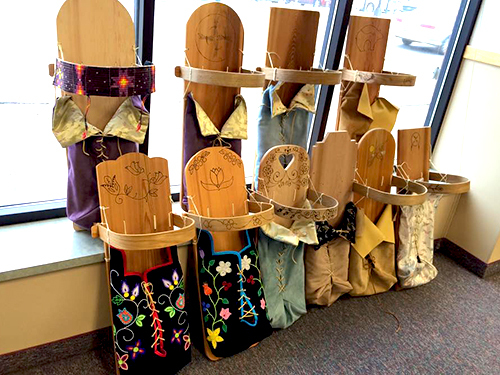 The MPRB is working in collaboration with the Native American community, descendants of Mahpiya Wicasta/Cloud Man and other interested participants to create a gathering place and interpretive area along the south and southeast shores of Bde Maka Ska. This project will commemorate Heyata Otunwe, honor the leadership of Mahpiya Wicasta and help share the broader history and contributions of the Dakota and other indigenous peoples who frequented and/or resided in this area. The project is expected to be complete this summer. Lake Calhoun was named after John Calhoun, a proponent of slavery who helped build Fort Snelling. Calhoun wrote the first draft of the Indian Removal Act of 1830, which passed into law under President Andrew Jackson, and led to the forced removal of thousands of Native people from their homelands (such as the Cherokee Trail of Tears). Calhoun also created the Bureau of Indian Affairs within the War Department during an era when Natives were seen as obstacles to white settler expansion.